I try to be resourceful and I try not to be wasteful. This particular evening, I tested my skills to wing yet another meal for myself. I did not expect it to look pretty and taste so good! If you like shrimp, this is an easy and fast dinner. The meal (Paleo and Whole 30 friendly): Cilantro and lime shrimp with "taco" seasoned zucchini pasta and Mexican flavored cauliflower soup. I'm not even sure I should be calling it Mexican flavored...but I can't think of what else to call it. Southwestern perhaps? Hopefully this is not offensive to anyone, I'm simply calling it that based on the spices I used that are usually used to prepare Mexican food. Paleo, Mexican Flavored Cauliflower Soup: Start making the soup first because you need the cauliflower to boil and soften. I did not have any chicken broth or vegetable broth on hand so I boiled my cauliflower in water. You can use broth if you have it. While it is boiling you can start on the zucchini. Once the cauliflower has boiled and softened to the touch (with a fork), drain the water from the pot. If you boiled in broth, reserve your broth separately in case you want to add some back into the soup for flavor or soup texture. I added almond milk (I was out of coconut milk also) to the pot a little at a time as I used my OXO immersion blender to puree the cauliflower. I continued to add almond milk until I got a thick soup-like consistency. You can add broth in as well to get the consistency of soup that you prefer. I used unsweetened, plain almond milk so it did not add much flavor to this cauliflower soup. Once I got the consistency down, I added a lot of onion powder, garlic powder, cumin, and pink Himalayan salt to the soup. As I blended those in I occasionally tasted the soup until I got a flavor that I liked. You can add in a bit of chili powder as well! Cumin was the primary seasoning I kept adding more and more of. To serve, I sprinkled chili power on top to make it prettier (for myself). Paleo "Taco" Seasoned Zucchini Pasta: If you've read my previous posts about meals, you know I love my spiralizer. It's love. It's magic. No joke. Before using it, wash your zucchini and cut off the ends so that you have a flat surface. Wedge the zucchini into the spiralizer using blade C (if you have the 3 blade spiralizer) and work it's magic until you have pasta. Ta-da! Love this thing. Using either a non-stick saute pan , the Copper Chef pan I love so much, or your regular pan with a bit of olive oil - start sauteing the onions and chopped bell peppers first on medium-high heat. Since this dinner was to serve only me, I used a 1/3 of a yellow and 1/3 of an orange bell pepper, and froze the rest to roast on another evening. Once the onions are turning translucent, turn the heat down to medium and you can add in your zucchini noodles as well as the following seasonings: chili powder, cumin, pink Himalayan salt, ground red pepper and a dash of paprika. Chili powder and cumin are the two main seasonings to focus on giving you the taco-ish flavor. BE CAREFUL to only start sauteing the zucchini noodles simultaneous to sauteing the shrimp so that your zucchini noodles do not get soggy. Zucchini naturally "sweats" water and a lot of it so you have to be pretty snappy when cooking with it. Paleo Cilantro & Lime Shrimp: This is the easiest part. If you have frozen shrimp, you can run warm water over them in a colander to thaw them out. 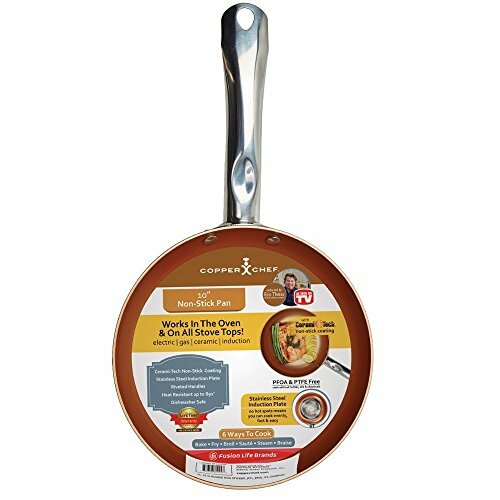 I used my Copper Chef pan, but if you do not have one you can add a little olive oil or coconut oil to your pan first. Turn the stove on to medium heat and once the pan has heated up, add in your shrimp with about 1/3 cup of lime juice (but who's measuring anyway?) and either fresh diced cilantro or use cilantro paste. I would prefer fresh cilantro always, but working with what I have on hand and typically having to toss unused cilantro into the garbage, I have learned to keep cilantro paste in my refrigerator. Let the shrimp cook until pink, flipping as needed so that both sides of the shrimp are cooked through. This should only take 3-5 minutes as shrimp cooks fast. Serve the shrimp over your taco-seasoned zucchini pasta and add a dash of chili powder to this too for good measure. It looks pretty and makes the effort of cooking for yourself worthwhile. I hope you enjoy this "recipe" or that it inspires you to try something similar. If you've dabbled with something like this I'd love to hear about it. Please share with your friends who may need a flavorful meal without cheating their nutrition requirements! PS: You can pick up the Copper Chef pan and/or the Paderno Spiralizer by clicking on their image below, or my going to my "Amazon Store" to check out these and other items that I frequently use! I know my enthusiasm for these two products gets repetitive, but they've become my go-to's! 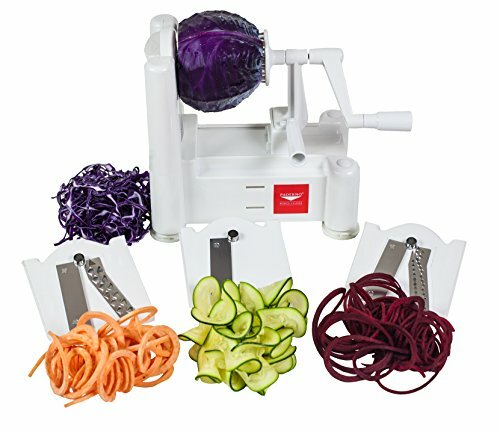 Paderno World Cuisine A4982799 Tri-Blade Vegetable Spiral Slicer.